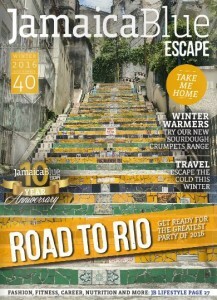 Welcome to the winter ’10th Anniversary’ edition of Jamaica Blue Escape. This issue is bursting with travel spots, home ideas, winter tips and tasty recipes to get you through the cooler months of 2016. More importantly, this issue is an ode to Rio. Not only is Brazil home to the greatest sporting show on Earth this August, it’s also the home of our delicious new Seasonal Single Origin Blend. Sit back, relax and enjoy . . . and don’t forget to share your winter Jamaica Blue experience on Facebook and Instagram using #jbescape. You could find yourself in an upcoming edition!